North view of Peddi Naig Droogam. bl.uk > Online Gallery Home	> Online exhibitions	> Asia, Pacific and Africa Collections	> North view of Peddi Naig Droogam. 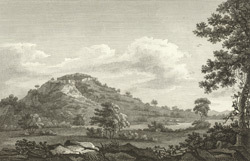 Etching with line-engraving of a north view of Peddi Naig Droogam by William Byrne (1743-1805) after sketches Robert Home (1752-1834) had made when he had accompanied the troops in Lord Cornwallis's campaign against Tipu Sultan in 1792. Plate 21 from Robert Home's 'Select Views in Mysore, the country of Tippoo Sultan' published in London in 1794. Peddi Naig Droogam is situated at the head of a pass through the Eastern Ghats between Amboor and Vencatighery. It was cleared by the British during the Anglo-Mysore Wars in the late 18th century so that reinforcements could be provided to Lord Cornwallis.